It’s easy to become attached to the advice, feedback, and ideas we give to other people. We’re trying to be helpful, but when the person doesn’t take our suggestions we try to convince them. That’s attachment. Here’s how to share with others with no strings attached. The listener wrote again saying it’s a shame that the sound quality doesn’t match her excellent content and to consider improving it. The presenter responded saying she had considered it, liked it as it is, and if he didn’t then he was welcome not to listen any longer. The listener was disappointed because she wouldn’t receive her feedback. But he was mistaken, she had received his feedback but choose not to follow it. When we insist someone follow our advice, feedback, or ideas, we give it with attachment. In doing so, we go from being helpful to trying to force the person to do what we suggest. That’s frustrating for both parties. The best advice, feedback, and ideas come with no strings attached. To avoid attachment when giving advice, feedback, or ideas, have this attitude, “You can take it, leave it, or modify it. It’s up to you.” Realize from the start that for whatever reason, the other person may not want to follow your suggestion – and be okay with that. Leave the choice with them. Let it go. It’s up to the other person to do something with your suggestion. That’s his or her choice. And depending on their actions you can choose how to further engage with this person. That’s your choice. If you find yourself trying to explain, convince, or “push back” then you’re attached. You may think that the person doesn’t understand your feedback or idea, and that’s why he’s not doing it. After all, if he understood you, he would certainly agree. Right? Not always. People evaluate their situations based on different criteria than our own. They have their own ideas. And they have their own priorities. Leave the choice up to the other person. 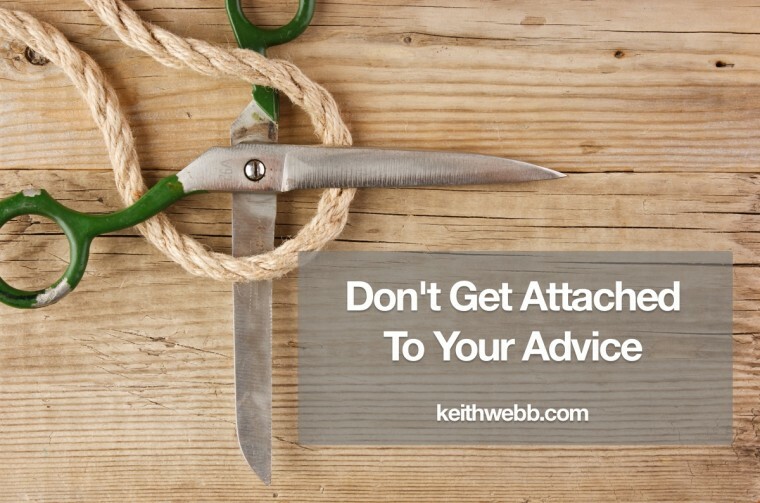 Share your advice, feedback, or ideas without attachment.